Promotion Only, 'Not for Sale' printed on folder. 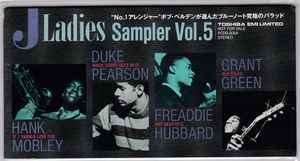 'Freddie Hubbard' mis-printed as 'Freaddie Hubbard' on long folder cover. 'When Sonny Gets Blue' mis-printed as 'When Sunny Gets Blue' on long folder cover. Folder shows photos of all 4 artists on the front and advertises their albums of that year of release on the reverse of the folder.